For a company that had to be dragged to the microserver space – though not exactly kicking and perhaps muttering instead of screaming – Intel has certainly taken a shining to the market and is not about to give X86 rival Advanced Micro Devices and the army of ARM RISC server wannabes any chance of getting a toehold in this nascent but fast-growing part of the market. Particularly after AMD bought microserver poster child SeaMicro in February. And to that end, concurrent with the ongoing rollout of "Sandy Bridge" Xeon E5 processors for two-socket and four-socket workhorse servers today, Intel is also pushing its first server chips based on the "Ivy Bridge" design out the chip fab warehouse door, and these are for single-socket boxes. Because of the close affinity between Xeon E3 and Core processors and the demands of hyperscale data center operators who want dense single-socket server nodes for some of their workloads, the new architecture has appeared at the low-end of the server market first for the past two generations of Xeon chips. Expect this to continue from here on out. The Ivy Bridge chips, which have already been launched for desktop and laptops as the Third Generation Core processors, are to shrink down to 22 nanometers using the Tri-Gate transistors that give Intel a considerable boost in performance and power efficiency compared to the prior 32 nanometer processes used to etch the Sandy Bridge chips. There is not a huge architectural change with the Xeon E3-1200 v2 processors compared to their Xeon E3-1200 v1 predecessors, but the extra transistors allow for some new features, such as larger cache memories. They also allow Intel to crank the clocks and drop voltage on certain models, thereby lowering power consumption and increasing heat dissipation, which is vital to hyperscale data center customers. For companies that use the Xeon E3-1200 processors for entry workstations, the extra clocks and faster graphics cards also make these variants of the Xeon E3 chips with integrated Intel HD graphics processors that much more attractive. The new HD Graphics P4000 processors embedded on three models of the new Xeon E3 chips support up to three displays; offer up to two times the media processing capability; and according to Intel are good enough for 2D workstation work and suitable for entry 3D workstation applications. One model in the family, the E3-1265L, supports the less-capable HD Graphics 2500 GPU on chip. All of the new Xeon E3-1200 v2s sport USB 3.0 peripherals, which will make users less cranky when they link to external drives and other peripheral devices such as smartphones, tablets, and so on. To keep the Xeon E3 firmly in the single-socket server and workstation space and not muddle up the market, the processor, memory, and I/O options are fairly basic. If you need more capacity, then you need to upgrade to a server or workstation using the Sandy Bridge Xeon E5-2400 (announced today) or the Xeon E5-2600 (announced back in early March ). Or, you could wait for a "Haswell" Xeon E3 chip, presumably to be called the Xeon E3 v3 or something similar, but we won't see that chip until Intel refreshes its desktop and laptop lineup in early 2013 if all goes according to plan. The Xeon E3-1200 v2 has four cores, just like its predecessor, but is available in a two-core, low-voltage variant that has a thermal design point of only 17 watts, if having the absolute lowest power possible per socket is what matters to you. Like other Ivy Bridge chips, these Xeon E3-1200 v2 chips have 32KB of L1 instruction cache, 32KB of L1 data cache, and 256KB of L2 cache per core. The processor also has has 8MB of on-chip L3 cache memory, which is knocked down to 3MB on the power-sipping 17 watt model. The Xeon E3-1200 v2 socket has two DDR3 memory channels that support two memory slots each for a total of four slots and a maximum of 32GB of memory for a single node. This may not seem like a lot of main memory by modern standards, but it is sufficient for a lot of workloads and using 8GB memory sticks is very affordable; if you only need 16GB of memory and know you won't need to expand later, then it is even less expensive to load up a machine with 4GB DDR3 sticks, and for a lot of hyperscale data center shops – who use these machines as nodes for physical hosting rather than virtual server hosting – the most important things are the low cost of the server node and the number of nodes that can be packed into a rack. 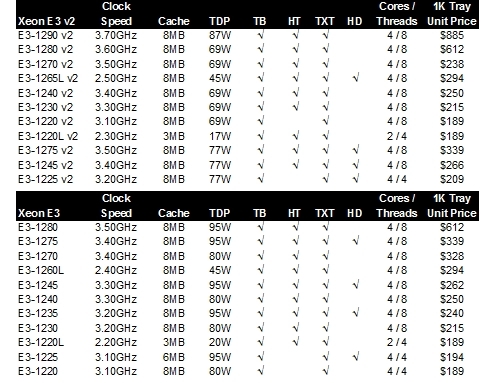 Incidentally, the chart above says the Xeon E3-1200 v2 supports 1.6GHz DDR3 memory, but the spec sheet table says the chip supports 1.07GHz and 1.3GHz sticks. El Reg is pretty sure that all three speeds will be supported, so pick your poison. 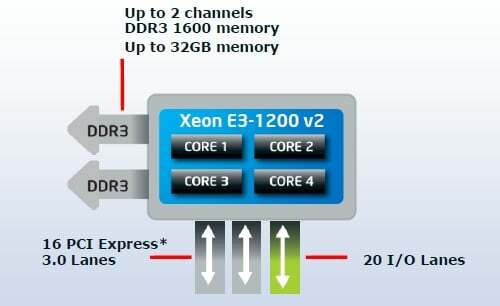 The Xeon E3-1200 v2 has a single PCI-Express 3.0 controller built onto the chip. This controller supports up to 16 lanes of I/O, which can be aggregated in different ways by the "Patsburg" C206 series chipset, depending on the mix of slots a motherboard maker wants to put on the board. There are an additional four lanes of PCI-Express 2.0 I/O hanging off the chip, which plugs into the LGA1155, or Socket H2, processor socket. All of the members of the new Xeon E3-1200 family support error correction on the main memory, have VT-x virtualization acceleration electronics to make server hypervisors work better, and support Intel's Trusted Execution Technology (TXT) gadgetry to help secure the platform and the hypervisor that might be running atop it from tampering. (Given the workstation and microserver workloads that the Xeon E3s are aimed at, VT-x may not be important, but it costs Intel little to put it in.) All but two of the 11 new Xeon E3s support HyperThreading, Intel's implementation of simultaneous multithreading that makes each core on the chip look like two virtual cores to the operating system and hypervisor – and which in many cases makes workloads run a bit faster than they would without this additional layer of virtualization. The Xeon E3-1200 v3 chips also support the AES-NI encryption instructions that debuted with selected models of the "Westmere" Xeon processors – the instructions were carried forward into the Sandy Bridge Xeons and now the Ivy Bridge Xeons. Based on some SPECpower_ssj2008 benchmark tests that Intel has run (but which are not yet available at press time), the new Xeon E3-1200 v2 processors offer as much as 32 per cent better performance per watt compared to last year's Sandy Bridge models, which also sported four cores but which burned quite a bit hotter, SKU for SKU. In an interesting, but perhaps not exactly valid comparison, Intel pitted a bunch of rack servers using last year's Xeon E3 processors against this year's models packaged up in microservers. Using the SPECint_rate_base2006 integer benchmark test as a workload, Intel put 41 rack servers using the E3-1220L v1 processor from last year into a rack with a 1U 48-port Gigabit Ethernet switch. These rack servers had Turbo Boost enabled and were configured with 8GB of memory and a 64GB SATA SSD (the latter of which helped lower power consumption). This rack of gear delivered an aggregate score of 2,829 across the nodes on the SPEC integer test, and each node consumed 51 watts. With the switch in there, the rack had a power draw of 2.3 kilowatts. Switching to a microserver form factor using ten 3U enclosures that each held a dozen microservers (for some reason, only 119 nodes were in the rack) – and still leaving room for three 48-port Gigabit Ethernet switches in the rack – the nodes (with the same memory and storage) consumed 36 watts each and the switches around 240 watts each. Add it all up, and that's an aggregate rating of 10,198 across the nodes on the SPEC integer test, and the whole shebang consumed 5 kilowatts. That's roughly three times the oomph per rack at twice the power consumption. Even if you used half-width Xeon E3 boards, which you could have created last year, you would only have 82 nodes for 4.6 kilowatts and you would need a rack and a half to match the node count and performance of the microserver setup – and you would have burned 6.9 kilowatts to get there.